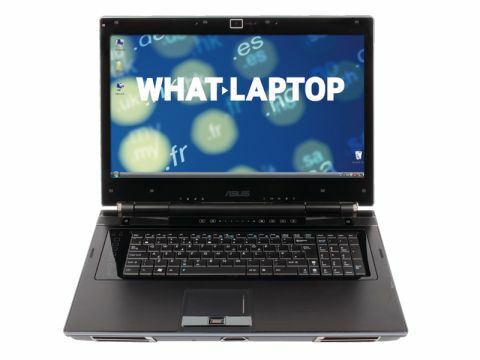 Asus has become better known for its Eee PC netbooks of late, so it's easy to forget that it also makes high-end and mid-range machines. The Asus M51SE (£699 inc. VAT) is aimed at the home user and offers impressive value for money. The 15.4-inch screen is one of the best in the class, producing sharp image quality and featuring lifelike colours that make it great for home and office use alike. An integrated Blu-ray drive allows HD movie playback, but those wanting to connect an HDTV may have to buy an adapter, as the Asus features an older DVI port rather than HDMI. Frequent travellers may also find the glossy Super-TFT coating frustrating, as it's very reflective. You'll find an ATI Mobility Radeon HD 3470 graphics card in place – a dedicated solution that offers enough performance for entry and mid-level multimedia tasks. You'll be able to play older games, and Blu-ray movies also play smoothly. The keyboard is of a good size, and offers excellent usability. The keys are springy and responsive, making it a comfortable laptop to use, although it does have a noisy typing action. Despite the relatively compact chassis, Asus has also squeezed in a dedicated numeric keypad, making it easier to enter data. The touchpad is large and offers precise control, and you'll find a fingerprint reader between the mouse buttons, giving an extra degree of security and making it easier to log into your account. With glossy black and silver patterned plastics, this laptop has a conservative design. It's well made, however, with the chassis proving tough enough for daily use and the thick screen surround offering plenty of protection for the display. This machine features an average specification, with a mid-range 2GHz Intel Core 2 Duo processor and 3072MB of memory providing power. There's enough performance to run the Windows Vista OS smoothly, although we found signs of lag when running multiple applications. Battery life was the biggest disappointment, lasting for just 142 minutes in our benchmark tests. This is under the three-hour minimum we expect from a laptop and restricts mobility. Peripherals can be connected using the three USB ports – although two are located above each other, so one bulky device may block the other port. Wireless connectivity comes from the latest 802.11n Wi-Fi adapter and Bluetooth. Although not the most inspiring machine, the Asus M51SE is a good all-rounder, only let down by the poor battery life. If you're seeking a semi-portable laptop for use in the home, or battery life isn't an issue, it's well worth a look.